Yesterday I shared my summer-proof foundation and concealer routine, and I also mentioned some tips on helping your makeup last longer. That post began to get super long so I decided to split the post up and share some more tips and advice in this post today. I often get asked makeup advice by friends, family, blog readers, and on Instagram/Twitter. Being a blogger and having studied beauty therapy and makeup at college, I’ve picked up some tips and tricks along the way that I want to share with you. For some people these might be too basic and stuff you may already know, but I think back to when I just started out in makeup, I had no idea, so I wanted to create a series sharing tips and tricks that past Samm would have seriously appreciated! The photo above is of my current foundation/concealer/primer collection, which admittedly is rather large. I sort through it regularly to get rid of old products or ones I don’t use. It’s important to use products within the time listed on the product- which is usually once opened, between 12-24 months. Skincare is a really important step to take before applying makeup. I always say that you can have the most raved about, expensive foundation but if your skin isn’t prepared then it isn’t going to work. It’s also going to help make your makeup last longer. I like to cleanse, tone and moisturise in the morning before makeup application. Make sure you leave your moisturiser/serums a good 10-20 minutes to fully absorb into the skin before applying makeup. My favourite moisturiser to use is the LUSH Vanishing Cream. I also really recommend the MAC Lightful C Marine Bright Softening Lotion- a brilliant toner that softens and smoothes the skin perfectly prior to makeup application. Exfoliating the skin is important to remove dead skin cells, which I do in the evening about twice a week. It’s also important to make sure you’re removing your makeup properly at night. This is something I do religiously, and the thought of sleeping with my makeup on makes me cringe for my poor skin! It’s important to understand your skin, and work out what type of skin you have to decide what type of foundation or concealer you need. There are many different influences on your skin type, both internal and external, such as hormones, skin disorders, medication, skincare products, diet, stress, pollution, sun exposure and product ingredients such as alcohol, fragrance, thick emollients, colourings, mineral oils and harsh scrubs. Normal: Normal skin is rare in adults. The skin is balanced, and is neither too dry nor too oily. Pores are small, skin has a good moisture content, with a smooth and even texture, even pigmentation and the skin is a healthy colour (because of good blood circulation). Dry: Dry skin is lacking oils (sebum) and moisture. The skin texture is often uneven and flaking, skin feels tight, the pigmentation may be uneven and the skin is often sensitive. Oily: Skin produces excess oil, and you can see the all over shine on the face. Pores are often large and the increase in oil often causes blemishes. Combination: This is a mixture between dry and oily, with the t-zone (chin, nose and forehead) being the most oily. So now you’ve worked out what skin type you have, it’s time to find a foundation- which is not an easy task! It seems like brands are constantly releasing new foundations, claiming to be the next big thing and persuading customers with an endless amount of promises the foundation makes. I admit I’m often pulled in by the clever advertising methods, but I’ve finally come to the conclusion that the foundation isn’t going to actually turn me into the model in the pictures *sigh*. Tinted moisturiser: provides light coverage, moisturises and helps to even out the skin tone. BB cream: blemish balm, provides some coverage with various different skincare benefits- depending on which brand you choose. Often contain SPF and tend to have more coverage than a tinted moisturiser. Good for all skin types, depending on the finish/brand you choose. CC cream: stands for colour correcting, CC creams are meant to address things like redness, dullness and discolouration in the skin. I personally find them pretty much the same as a BB cream! Liquid: Liquid foundation is the most popular choice, and works for any and every skin type. They’re available in different finishes from light to full coverage and dewy to matte, depending on your skin type and the coverage you want. Powder: Powder foundations are a good choice for people with oily skin. They can provide different levels of coverage and finishes depending on which brand you choose. Mineral powder: Available in pressed or loose powder form, mineral foundations are normally fragrance free and non-comedongenic so they won’t block pores, often formulated without fragrances, binders, dyes or preservatives which eliminates ingredients often associated with skin irritation. But some can often contain talc and synthetic fillers that can cause problems for the skin. Cream: Medium to full coverage, which can be build depending on the coverage you need. They can be thick and feel heavy on the skin, so try sheering out with a little bit of moisturiser. Stick: Super full coverage, often thick and heavy. They’re usually used in media and stage makeup, and a lot of drag queens love them. I personally wouldn’t recommend them for everyday wear, as they’re thick and can block pores, causing blemishes. They’re not great for dry skin as they’ll cling to and emphasise dry patches. Mousse: Air whipped to make it lighter and smoother. I say totally avoid- most of us had the dreaded Maybelline Dream Matte Mousse disasters! They also come in different undertones; pink, yellow, and sometimes neutral. It’s important to make sure you’re wearing the right tone so your foundation looks natural on the skin. If you don’t need full coverage, then try a tinted moisturiser or BB cream. If you have large pores or acne then stay away from shimmery products, like in primers and foundations. Same goes for if you have mature/wrinkled skin, as it will accentuate and bring attention to those areas. Apply foundation in thin layers, as it’s easier to add than to take away product. I like to tip my foundation onto the back of my clean hand before applying it to my face. This is going to begin to warm the products making it easier to work with, an especially good tip if the foundation you use is more on the thick side. Its also important to use the right method of foundation application. I like to use and recommend the Beauty Blender Sponge, Sigma F80, Real Techniques Sculpting Brush or the MAC 130. 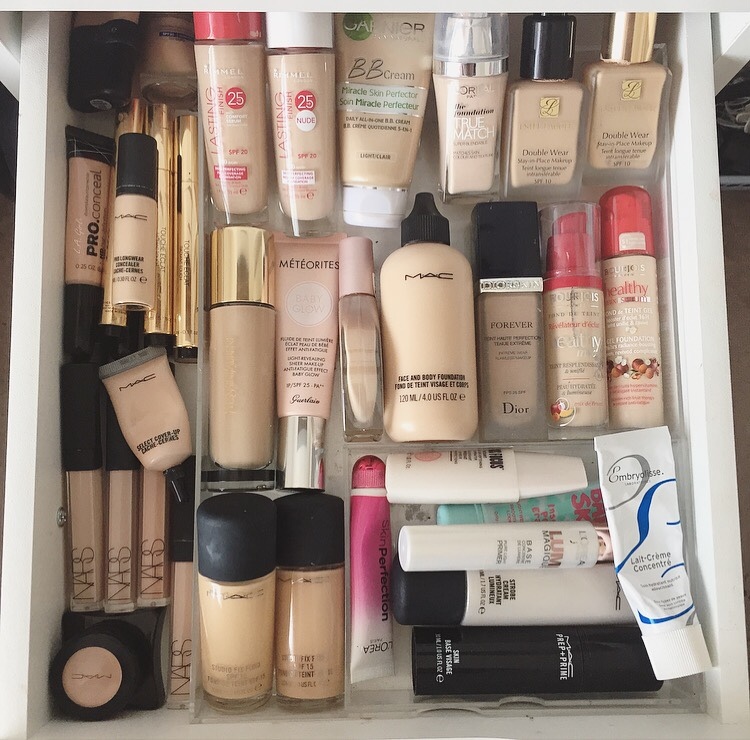 I’ve tried a wide range of foundations over the years, from drugstore to high end. I’ve personally found that high end foundations work better on my skin, but they come with the high end price tag. I’ve been disheartened before when I’ve found that a foundation hasn’t worked for me, especially after paying such a high price. So I always say to people ask for a sample! The good thing about high end cosmetic companies is that most of them do give samples. I always used to be too nervous/worried the counter would judge me to ask for a sample, but now I just think of the money I’m not wasting if it doesn’t work for me. The counter staff won’t get annoyed/angry (and if they do, walk away, don’t give them your time or money!). It’s a good way to test the colour in natural lighting as well, and if the foundation doesn’t work for you, then you’ve not wasted any money. Primers.. not everyone gets on with them. I go through stages where I don’t use them, as I find certain foundations just don’t get on with primers. Primers are used to prep the skin prior to makeup application and help it last longer. You’ll need to know what type of skin you have as to what primer you choose as they’re all targeted at different problems; such as controlling oil, smoothing, hydrating, filling pores, and colour correcting. My favourite to use is the MAC Strobe Cream. As for setting sprays; some people love them, some people hate them. I happen to love them. However I haven’t found they necessarily help prolong the lasting power of my makeup, I like to use them to freshen my makeup and prevent that powdery look I can sometimes get. My favourites are MAC Fix+, Urban Decay All Nighter, Mario Badescu Facial Spray or the Smashbox Photo Finish Primer Water which works as both a primer or setting spray. Green: Green is used to cancel out redness on the skin. Green and red are opposites on the color wheel, so applying a green concealer over a red area will counteract the redness on problem areas with blemishes or rosacea. Purple: Purple concealer (more “lilac” than a dark purple) is used to cancel out yellow tones on the skin. If you have a dull, yellow complexion, it will really help to brighten up your face. 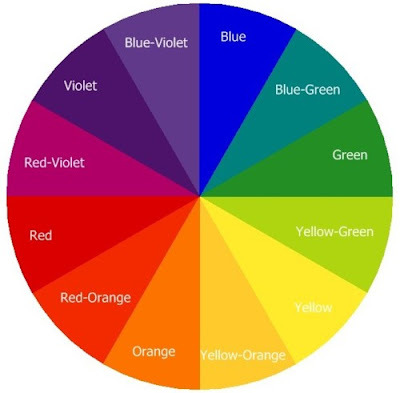 Again, purple and yellow are opposites on the color wheel, so it will counteract the yellowness. Peach/orange: These are used to cancel out blue tones in dark under eye circles. Yellow: Like the peach/orange concealer, yellow is good for using to cancel out purple toned dark under eye circles, or any veins or bruises you may have. White: White concealer is used for a more intense highlight. It’s good to use in the inner corner to brighten and open the eyes. If you have fair/light skin you can use it under the eyes, but be cautious. If you have medium-dark skin, I would say steer clear of using this on the under eye area. You can go a shade or 2 lighter than your foundation for under eye concealer as this is going to help highlight and brighten the area. But don’t use a lighter shade of concealer on problem areas and blemishes, it has to match the foundation colour, or else its going to highlight and bring attention to the area. Using your ring finger to apply concealer is going to warm the product, and its the weakest finger so it’s not going to pull or tug on the delicate under eye area. Not everyone uses powder. Powder is going to help set your foundation and concealer to make it last longer, and control oil. If you have dry skin, you could probably skin this step. If you have skin more on the oily/combination side, then powder is a must. I personally only use powder in my t-zone, as thats the only place I get oily. Always dab the powder into the skin rather than sweep it over, as that can move your foundation and powder around. Pressing it into the skin is going to help make your base last longer. My favourite powders are the MAC Studio Fix Powder (my holy grail!! perfect for combination skin), Chanel Poudre Universelle Libre (great for normal-dry or mature skin), Smashbox Photo Set Finishing Powder (great for oily skin), Rimmel Stay Matte (super affordable powder perfect for oily skin!) and the MAC Mineralize Skinfinish Natural (good for all skin types). So I’ve been sat here typing this post for just over 5 hours, and I’ve read it over and over checking that I’ve covered what I wanted to cover in this post. I’m aware its ridiculously long, but I didn’t want to skip any information. I hope this has been somewhat helpful to you. If you have any questions, or more tips- feel free to leave them in the comments section below!